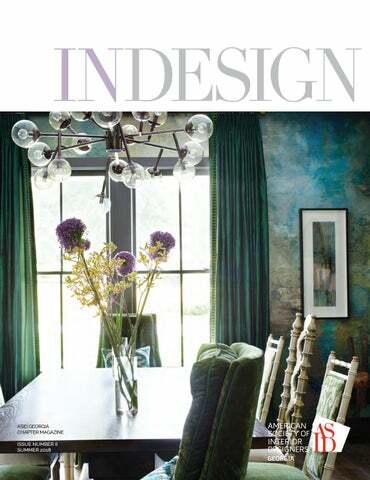 h of t e 201 Jamie Williams 352-448-5873 | jwilliams@dsapubs.com INDesign Magazine is published quarterly for the ASID Georgia Chapter of the American Society of Interior Designers by DSA Publishing & Design, Inc. Editorial content and the INDesign magazine are controlled and owned by the Georgia Chapter ASID. 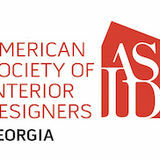 Reproduction of this publication in whole, in part, or in any form is strictly prohibited without the written permission of the Georgia Chapter of ASID. Congratulations and Thanks! It’s that wonderful time of year again! The 2018 Design Excellence Awards were hosted by the ASID GA Chapter in a spectacular ceremony on May 3rd. This event always blows me away with the amazing talent that is showcased here in GA - and this year was no exception! CONGRATULATIONS to all our winners! You are the shining stars of our chapter and you inspire us all. This event would not be possible without the generosity of our Sponsors. We THANK YOU for your continued support of our chapter. I encourage all members to utilize our sponsors in their next project as a way to show appreciation for the value they bring to our organization. And to our volunteers, my most sincere gratitude for all that you do. It is truly amazing how this event comes together with so many outstanding volunteers, who give so freely of their time and energy. A BIG THANK YOU to you! Summer is finally here, and vacations are underway, but our chapter is still busy at work! The 2018-2019 Board of Directors will be preparing for their term with a Strategic Planning Session and training at ASID’s Leadership Experience in July. As they organize their term, please consider volunteering for a committee. Volunteers are the core of our chapter and we value any time you can give. As you may have read from a couple of emails we sent, our Chapter Administrator, Elayne DeLeo, has moved on to another position. We wish her luck with both her new endeavors and her continued involvement with Modern Atlanta/Atlanta Design Festival. I hope you all have a great and relaxing Summer and I look forward to seeing you at our next big event, the Annual Meeting. Look for details coming out soon! With curated collections of furniture, accessories, fine linens, tabletop, rugs and much more. The select resources you seek—known and new—in a single location. This is AmericasMart. Where global style trends and sourcing opportunities are yours to discover. Showrooms: July 10 – 16, 2018 Temporaries: July 11–15, 2018 Select Showrooms Open Year Round Monday – Friday, 10 a.m.– 4 p.m.
LeVino Jones Medical Interiors, Inc.
Michael Lutz, Associate ASID Teresa Badke Ashley McClure Carolina Montilla EP + Co.
California Closets creates the perfect storage solution for you and the way you live. Visit us online or in our showroom today to arrange for your complimentary in-home design consultation. ALP HAR ETTA 53 S. Main St. B U C K H EAD 631 Miami Circle NE LAWR E N C EVI LLE 5155 Sugarloaf Pkwy. ©2015 California Closet Company, Inc. All rights reserved. Franchises independently owned and operated. Celebrating 35 years of exquisite interiors and innovative architecture, with beautiful spreads illustrating everything from the latest looks to timeless classics. PDI Kitchen, bath & Lighting 6 Metro Atlanta Showrooms 770.963.9231 Rely on PDI for your DREAM kitchen or bath! OUR TOTHETRADE LOYALT Y PROGRAM The MG+BW Comfort Club offers you 30% – 35% savings every day, with exclusive access to special offers and services. Please contact a Signature Store near you for more details.